Charakter - Inquisitor. Punkte: 11/14. Ausdauer: 10. 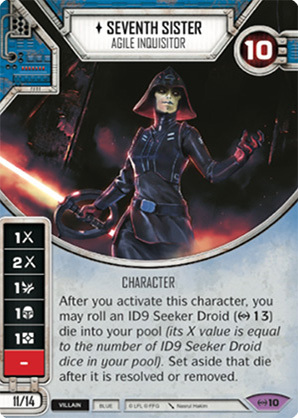 After you activate this character, you may roll an ID9 Seeker Droid (13) die into your pool (its X value is equal to the number of ID9 Seeker Droid dice in your pool). Set aside that die after it is resolved or removed.